Davie--an ugly duckling growing up in small-town Mississippi--is positive her life couldn't be any worse. She has the meanest mother in the South, possibly the world, and on top of that, she's pretty sure she's ugly. Just when she's resigned herself to her fate, she sees a movie that will change her life--"Sixteen Candles." But in her case, life doesn't imitate art. Tormented endlessly in school with the nickname "Monkey Night," and hopelessly in unrequited love with a handsome football player, James Farrell, Davie finds that it is bittersweet to dream of Molly Ringwald endings. When a cruel school prank goes too far, Davie leaves the life she knows and reinvents herself in the glittery world of Hollywood--as a beautiful and successful lounge singer in a swanky nightclub. 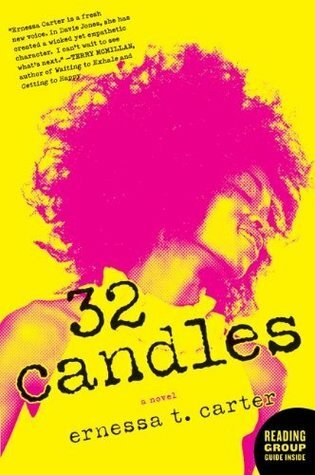 I came across 32 Candles when it was initially in 2010, I loved the cover and that got me to read the synopsis. I am not new to women's fiction or chick lit. I have read a few chick lit books in the past. I normally don't review them, but I do read and enjoy them. 32 Candles was unique to me because it is the first chick lit book that crossed my path that had an African-American main character (Davie). And the fact that Davie was a little nerdy black girl as a child reminded me of myself. I was sold and 32 Candles was placed on my TBR List. Did Carter pull it off? Yes, because 32 Candles was a engaging and funny read. Everything seemed to fit perfectly (which not a bad thing in this case), it was kind of like watching a movie about the nerdy girl and the mean girls. In fact, it was exactly like that. The reader knew what was going to happen but when it happened it an emotional reaction was still achieved. There were an few unexpected twist, but I think they made the story more interesting and gave it a darker tone. I liked the darker tone, because it gave the book more depth and explained some of the characters reactions. The No part of the answer is because of the darker tone. Some major issues were brought up in 32 Candles and they were just sort of swept up under the rag. They were just sort of thrown in as a way of saying "this is why Davie and her mother's relationship is awful" on to the kick scene. I can see this being done in order to keep the overall feel of the book light and funny, but I wish it had been executed better. The real strength of 32 Candles is the characters. All the characters were unique and well rounded. Carter was really successful in giving each character a distinctive personalities which readers where able to see through Davie's eyes. Davie's character was very likable She was quirky and funny, yet smart. She came off as a real person, very three dimensional. What I like most about Davie is that just when the reader thinks that they know her, she hits them with another side of her personality. Which was great because I ended up liking her even more. While Davie was the main character, I think the one that I enjoyed most was Nicky. Mainly because he provided great laughs. He was completely comfortable with him and without even trying was hilarious. The one character that I thought could be a little bit more developed was Davie's love interest, James. He just seemed to stay the same throughout the book. Never really growing or changing. For a debut novel, this was well written. It is clear that Carter has a talent for writing and has a great sense of humor. I found her writing to be so engaging that I read this book in two days. I just could not put it down and I had to see what was going to happen next. Because of some of the unexplored, glanced over dark topics of this book and the fact that James was sort of flat. I took off half a star. I understand that as a chick lit book, the atmosphere is suppose to be a light and funny, but I would rather have had the dark topics not brought up at all instead of glanced over. If someone asked me if I would recommend this book. I would tell them yes. In fact, I am looking forward to reading Ernessa T. Carter's future works.